Charles de Montesquieu was a French lawyer and Enlightenment philosopher who has become best known for promoting the idea of the separation of powers in government as a means for securing the people's liberty, a principle that has been enshrined in the constitutions of many nations around the world. Born: January 18, 1689 in Château de la Brède (near Bordeaux, France). The son of a soldier and an heiress, Charles de Montesquieu, first studied to become a lawyer and even headed the criminal division of the parliament in Bordeaux for a nearly a decade. He eventually resigned so he could focus on studying and writing philosophy. Throughout his early years, he witnessed numerous important political events, such as the establishment of a constitutional monarchy in England, and he felt it important to communicate his reactions to such events to a wider audience. As a political philosopher and social critic, Charles de Montesquieu was unusual in that his ideas were a combination of conservatism and progressivism. On the conservative side, he defended the existence of the aristocracy, arguing that they were necessary to protect the state against the excesses of both an absolutist monarch and the anarchy of the populace. Montesquieu's motto was "Liberty is the stepchild of privilege," the idea that liberty cannot exist where inherited privilege also cannot exist. Montesquieu also defended the existence of the constitutional monarch, claiming that it would be limited by concepts of honor and justice. At the same time, Montesquieu recognized that an aristocracy would become too much of a threat if it sank into arrogance and self-interest, and that is where his more radical and progressive ideas came into play. Montesquieu believed that power in society should be separated among the three French classes: the monarchy, the aristocracy, and the commons (the general populace). Montesquieu called said that such a system provided "checks and balances," a phrase he coined and which would become common in America because his ideas about dividing power would be so influential. Indeed, only the Bible would be quoted more than Montesquieu by the American founders (especially James Madison), that's how much influence he had on them. 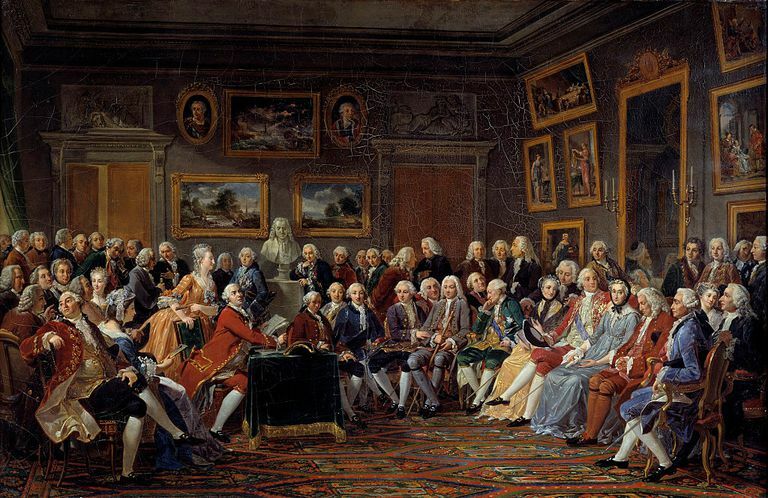 According to Montesquieu, if the administrative powers of the executive, legislative, and judiciary were divided among the monarchy, the aristocracy, and the commons, then it would be possible for each class to check the power and self-interest of the other classes, the limiting the growth of corruption. Although Montesquieu's defense of the republican form of government was strong, he also believed that such a government could only exist on a very small scale - large governments inevitably became something else. In "Spirit of Laws," he argued that large states could only be sustained if power became concentrated in a central government. Montesquieu was a rather than any sort of traditional Christian or theist. He believed in "nature's " rather than a personal deity that intervened in human affairs via miracles, revelations, or answered prayers. In Montesquieu's description of how French society should be separated into classes, one particular class is obvious in its absence: the clergy. He did not assign them any power at all and no formal ability to check the power of others in society, thus effectively separating church from state even if he didn't use that particular phrase. It is perhaps for this reason, along with its call for an end to any and all religious persecution, that caused the Catholic Church to ban his book "Spirit of Laws," putting it on the Index of Prohibited Books even as it was praised throughout most of the rest of Europe. This probably didn't surprise him because his first book, "Persian Letters," a satire about the customs of Europe, was banned by the pope soon after it was published. In fact, Catholic officials were so upset by it that they tried to prevent him from being admitted to the Academie Francaise, but they failed.